Global smart lighting and control systems market expected to reach approximately USD 102.92 billion in 2024, growing at a CAGR of slightly above 18% between 2018 and 2024. Owing to the demand and availability of personalized lighting and control system services, the market is anticipated to flourish globally. The report covers forecast and analysis for the smart lighting and control systems market on a global and regional level. The study provides historic data for 2015–2017 along with a forecast from 2018 to 2024 based on revenue (USD Billion). The study includes drivers and restraints for the smart lighting and control systems market along with the impact they have on the demand over the forecast period. Additionally, the report includes the study of opportunities available in the smart lighting and control systems market on a global level. This report offers comprehensive coverage of global smart lighting and control systems market along with, market trends, drivers, and restraints of the smart lighting and control systems market. This report includes a detailed competitive scenario and product portfolio of key vendors. To understand the competitive landscape in the market, an analysis of Porter’s five forces model for the smart lighting and control systems market has also been included. The study encompasses a market attractiveness analysis, wherein all segments are benchmarked based on their market size, growth rate, and general attractiveness. This report is prepared using data sourced from in-house databases, secondary, and primary research team of industry experts. 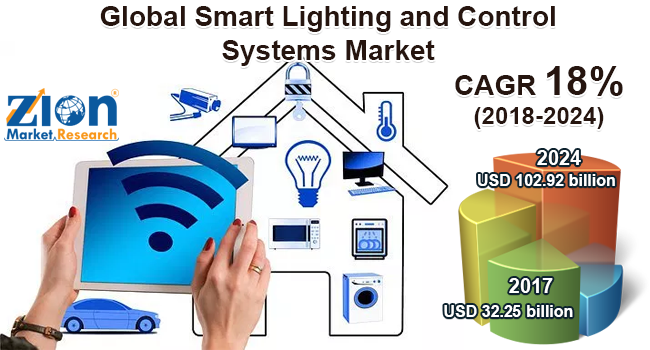 The study provides a decisive view of the smart lighting and control systems market by segmenting the market based on lighting source, connectivity, end user, and region. The lighting source segment is divided into compact fluorescent lamps, high-intensity discharge lamps (HID), and light emitting diodes (LED). The connectivity segment is further bifurcated into wired and wireless. The end user segment is categorized into residential, commercial, industrial, and government sector. All the segments have been analyzed based on present and future trends and the market is estimated from 2018 to 2024. The regional segmentation includes the current and forecast demand for North America, Europe, Asia Pacific, Latin America, and the Middle East and Africa with further country wise division into the U.S., Canada, the UK, France, Germany, Russia, China, Japan, India, South Korea, Australia, Brazil, Argentina, Saudi Arabia, UAE, and South Africa. The report covers a detailed competitive outlook including the market share and company profiles of the key participants operating in the global smart lighting and control systems market are Koninklijke Philips N.V., General Electric Company, Lightwave PLC, Eaton Corporation, LiFI Labs, Inc., Elgato Systems, Honeywell International, Inc., Belkin International, Inc., Lutron Electronics Company, Inc., and Acuity Brands Lighting, Inc. among others.